ATLANTA, Ga. – Eaton Cummins Automated Transmission Technologies took the wraps off the first project produced under its recently-announced joint venture – a new 12-speed automated transmission dubbed Endurant. The transmission is designed for linehaul applications with gross vehicle weights of up to 110,000 lbs and can manage 1,850 lb.-ft. of torque. Eaton Cummins Automated Transmission Technologies’ representatives also claim the transmission is up to 105 lbs lighter than competitive models. The Endurant was launched at the inaugural North American Commercial Vehicle Show. Davis said the transmission underwent more than two million miles of testing, including in extreme cold. Other features include: an internal electrical system that shields wires from corrosion and potential damage; a new smart prognostics feature that indicates when the clutch will need to be replaced; a new fluid pressure sensor that notifies drivers of low oil levels; smooth and intuitive shift strategies developed to optimize performance with the Cummins X15 engine. DeVito said the Endurant is a good fit for downspeeding, with its broad range of gear ratios, and provides the lowest cruise rpm in the market. Its ratios also provide excellent low-speed maneuverability, he added. Davis said the new transmission was developed in close consultation with customers, through three separate customer councils including fleets, drivers, and service managers. “This resulted in a product that hits the mark with customers” he said. The Endurant also offers the longest oil change intervals, at 750,000 miles – as much as 250,000 to 400,000 miles further than competitive models. And when oil must be changed, only 16 pints is required – about half the amount needed by most AMTs, Davis said. 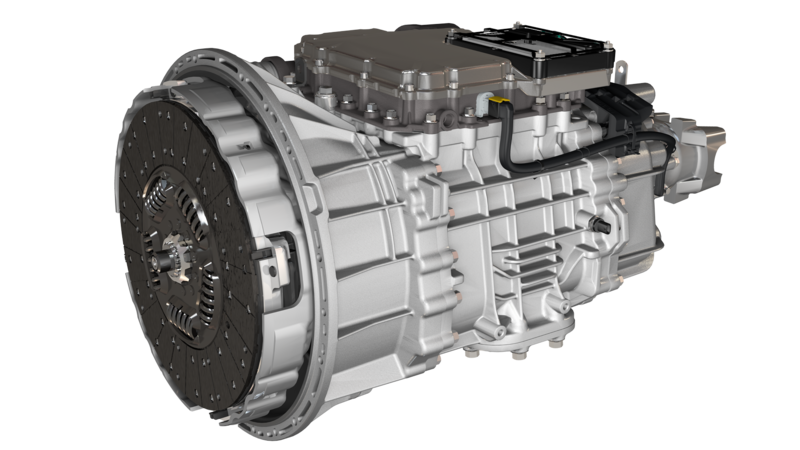 The new transmission will enter production Oct. 16 for Kenworth T680 and Peterbilt 579 models with Cummins X15 engines. For more info, visit www.EatonCumminsJV.com/endurant.